Is it ok to eat right before bed? Posted October 2, 2017 under Ask Us. Yes. If your stomach is grumbling and dinner was a few hours ago, there is nothing wrong with having a light snack before going to bed. What you eat more important than if you eat before bed. Choosing a balanced snack with a combination of carbohydrates, protein and fat can keep blood sugar levels in check overnight and prevent those hunger pangs from keeping you up. 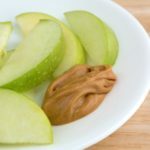 Oatmeal with milk, yogurt and berries, or an apple with peanut butter are a few balanced snack ideas. On the other hand, sugary snacks like ice-cream, soda, cookies and high fat foods like pizza, fried foods, and ice-cream should be avoided right before bed. Your body doesn’t digest these types of foods as well at night so they can keep you up with your stomach gurgling.